Piano Sonata in F Major K280 (189e) composed by Wolfgang Amadeus Mozart (1756-1791). 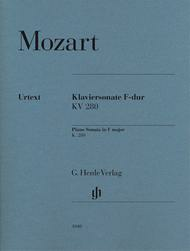 Edited by Ernst Herttrich. For Piano. Henle Music Folios. 18 pages. G. Henle #HN1040. Published by G. Henle (HL.51481040).Now available as a practical and reasonable single edition, drawn from the Henle edition of the complete Mozart sonatas.